Trash, Wine or Plastic Bag Tote! This lovely little design is also quite popular! Thanks to the Oilcloth Addict for this original pattern to hold plastic bags in our homes or garbage in our car. I refer to this as the Trash Tote - it can hook around your cup holder, center console or even over the back of the head rest to collect all car garbage. Don't worry about the drops left in your latte or the wet napkin soaking up spills, throw them all in. Once it is stuffed, have your kids empty it out & you are good to go. I have actually taken the hose to one of my trash totes, set it to dry & back to the car, good as new. If it hurts your soul to use such a lovely piece for trash, you can hang it in your pantry or mud room to collect your plastic bags from a day of shopping. Need a gift with a hand-made flare? Add some tissue paper and your favorite bottle of wine and gift away. You can always let the receiver decide how she'll use it! 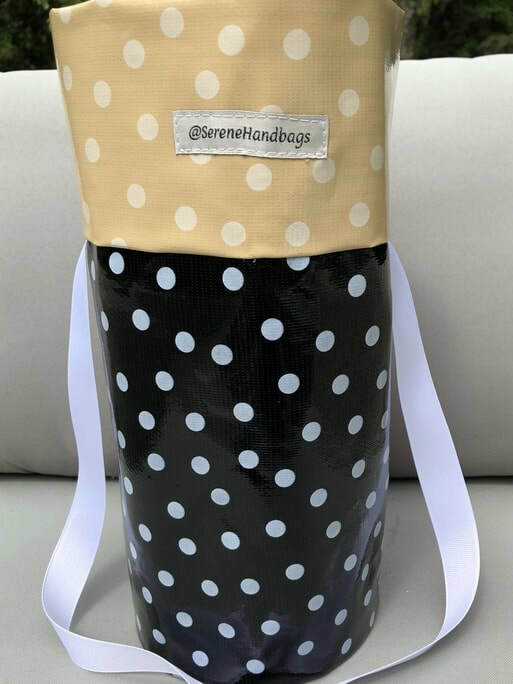 Perfect Wine Tote - Keep It or Gift It! More muted options for the men in your life - some of these materials are no longer available but we I can work to find something comparable.